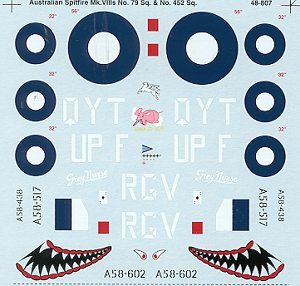 Not a subject that one sees too often, this sheet offers markings for three different Spitfire VIIIs of the RAAF. As many of you know, the Mk VIII Spitfire was the main design that took the later Merlin 61 engine. It also had a retractable tail wheel and most had an enlarged rudder. The Mk.IX, while built in greater numbers, was really nothing more than a reengined Mk.V. In fact, many of the 'new' Mk.IXs were recycled Mk.V aircraft that had been brought in for rework after having been damaged. The Australians got their Mk.VIII aircraft rather late in the war so were not able to rack up much in the way of air to air kills with it. It also didn't help that they were given a bit of a 'backwater' in terms of places where there was lots of Japanese air defense. Mainly the Aussies spent the last half of the Pacific war rooting bypassed Japanese units out of the islands around Australia. Next is a 457 aircraft in ocean grey and dark green over medium sea grey. These were RAF paints. WC Gibbs had much success in Europe and managed to knock down some Japanese planes as well. This aircraft has a huge sharkmouth. The teeth should be white. Superscale is aware of this and will make an correction available to those who bought this sheet available shortly. Check the website via the link below for more information. This aircraft has a red spinner. Finally, a 79 Squadron aircraft with a bright green spinner. It is camo'd in RAAF light green and RAF dark green over RAF medium sea grey. This plane also has the white tail and wing leading edges of those based in New Guinea. For dedicated Mk.VII kits in 1/48, you have ICM and I 'think' that Hasegawa has also done one, but I'm not positive on the last. If you do use the ICM kit, be aware that the early boxings had major quality control problems regarding sink marks.